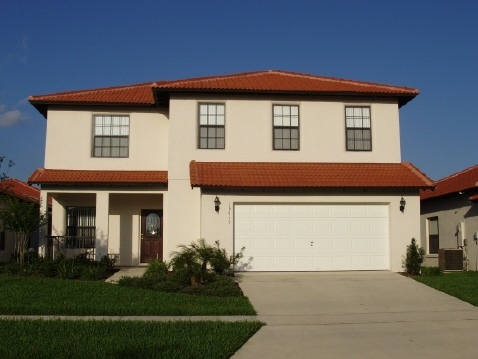 4 bedrooms/Over 2200 sq ft of luxury just 6 miles from Disney. A large covered private pool with MULTI – COLOURED underwater lighting, LUXURY furniture 2 X LOUNGERS 2 X RECLINNERS + FOOT RESTS 4 X CHAIRS, pool blanket, surrounded with mature flowering plants for PRIVACY (heating available ) Free standing hydrotherapy HOT TUB with optical lighting HEATING INCLUDED IN PRICE on bookings, GAMES ROOM (pool table, table tennis, Basketball, table football and more) equipped for adults and children, Tiled throughout the ground floor, FREE HI SPEED Wireless Internet Access, FREE National calls AND INTERNATIONAL VIA SKYPE, 1 x xbox and games, 1 x PS2 + games, Board games, DVD player and book library, Cable TV ( 2 x 37" 2 x 32" 1 x 21" LCD tvs ) in ALL rooms with Disney and EUROPEAN football, CD player + CDs, Wireless IPOD docking Station, FREE use of digital safe , Fully air conditioned (cool in summer – warm in winter) Monitored alarm,Electronic door lock - you choose the code smoke alarms and emergency lighting, 1 king, 1 queen, and 2 twin rooms , FREE use of Children’s cot (not a travel cot), bedding, 2 buggies, highchair and bed guards and baby alarm, travelcot. All bed linen and towels provided. Hair dryers in both bathrooms, Local 24 hour experienced Management Company, Close to attractions, restaurants, shops and close to golf course.s Only 5 minutes from 24 hour Wal Mart. Coded front door lock. BBQS available for rent through local Management Company. 5 MINUTES WALK TO LOCAL BAR. Our home is located on the small-gated community of High Grove, which offers a Clubhouse with computers with internet access; gym, plasma screen room,SOLAR HEATED swimming pool, spa, arcade and children’s play area, all a short walk from The Haven AND FREE TO USE FOR GUESTS. • The total amount has to be paid 12 weeks before arrival. • Cancellation charges: More than 12 weeks before arrival: deposit only /12 weeks or less: Full amount. La villa es agradable, el complejo donde está también lo es. La puerta a la piscina tiene un sistema de seguridad que esta mal concebido, prácticamente queda inutilizado el acceso al patio donde se encuentra, el sonido que emite la alarma es exagerado y no hay manera de controlarlo, si abres la puerta suena y no deja de sonar. Los servicios de Florida Bestvillas son excelentes. Reply from Mayra(FloridaBestVillas) Muchas gracias por su testimonio y las amables palabras, ambas son muy apreciada por nuestro personal. De acuerdo con la ley de Florida La zona de la piscina en las casas de vacaciones es un área restringida y el propietario tiene que asegurarse de que los niños menores de una edad específica no pueden acceder a ella sin un adulto. En este caso hay una alarma instalada que suena cuando alguien abre la puerta a la piscina presionar un botón al mismo tiempo. La misma tiene un botón configurado a una altura que los niños no puedan alcanzar. De esa manera la alarma se activará si un niño va a la piscina sin supervisión. Debía haber presionado este botón a su salida y entrada de la piscina a la villa para desactivar la alarma. Esperamos poder ayudarlos en su próxima visita a Florida. Schöne Villa, nicht ganz so schön wie die letzte, bei der wir den kleinen See mit einer viel schöneren Aussicht hatten. Die gated community ist sehr ansprechend. Manko: in der Küche hat es nicht gerade viel Geschirr (v.a. Pfannen) für Leute, die gerne kochen. I wanted to say thank you so much-we loved our stay in Orlando. The house was wonderful and we wanted to let you know, that we truly enjoyed staying there and are grateful for the use of the house. vielen Dank für deine super Betreuung, den netten Kontakt und die freundliche und ausdauernde Beratung!!! Das Haus war sehr schön und sauber. Die Häuser sind etwas eng aneinander gebaut (Pool an Pool), aber es war trotzdem ein toller Urlaub und wir können das Haus jedem weiter empfehlen.